Imagine easy access to larger areas of the city without gettng into a car or climbing onto a bus. 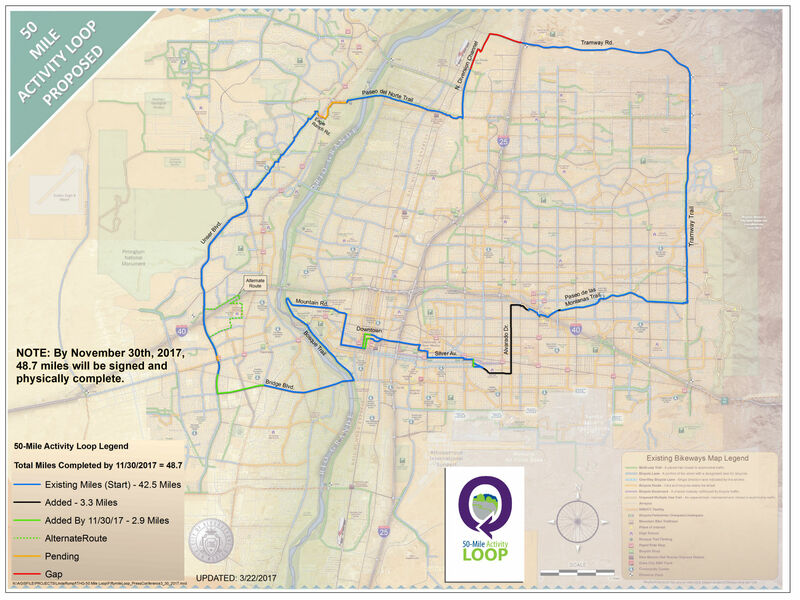 The City of Albuquerque is gearing up for Phase 1 construction to finish a 50-mile activity loop around the entire city. When completed, the trail will be a multi-use path and bikeway for hikers, cyclists, and runners. It's designed to fill the gaps in existing trails that many of us alreasy use. It also presents us with economic development opportunities. Think 50-mile fun runs and fundraisers, tourism events, and access to more shopping and eateries when you easily cycle to new areas. You can view the city of Albuquerque interactive map at this link. In the map, the blue lines show the existing trails, and red lines are areas the city will build with this announcement. The overall plan is ambitious and includes many other trail connections across the city. Phase 1 will connect Nob Hill to Uptown. VIEW the map in a larger format.